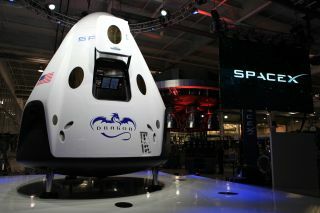 SpaceX unveiled its Dragon V2 spacecraft on May 29, 2014, showcasing a 21st-century space capsule built to carry astronauts into orbit. SpaceX founder and CEO Elon Musk detailed aspects of the design that was developed in partnership with NASA's Commercial Crew Program. NASA's plan to start launching its astronauts into space from American soil again has achieved another milestone. The three American aerospace companies competing to build astronaut taxis for NASA have completed the first stage of flight certification under the agency's commercial crew program, officials announced on Friday (May 30). Boeing's new model of the CST-100 spacecraft as seen at the company's Houston Product Support Center in Texas. All manned flights to the International Space Station today utilize Russia's Soyuz spacecraft, which costs NASA about $70 million per seat. This situation has been in place since the agency's space shuttle fleet retired in 2011. NASA hopes to have at least one commercial crew vehicle ready to ferry astronauts by 2017. All three companies — currently working under contracts collectively worth $30 million that were awarded in 2012 — spoke with NASA officials about how they plan to bring people to and from the space station. The reviews included discussions of safety requirements and how to meet NASA performance standards officials said. "It's allowed them to mature their plans and gave us additional insight into each company’s approach," said Ed Burns, systems engineering and integration acting manager for the Commercial Crew Program. "It also gave our NASA team and the partners a chance to work together towards certifying their systems." All three companies are now eligible for the next stage of certification, called Commercial Crew Transportation Capability (CctCap). But this also depends on funding, as NASA is waiting to hear how much money will be available for this phase. The agency said it will announce "one or more" CctCap awards later in 2014, depending on what Congress approves. CctCap will require companies to do at least one crewed flight test each to make sure their spacecraft perform well and can dock to the space station. Once that hurdle is cleared, two to six more missions will be required per company "to enable NASA to meet its station crew rotation requirements," the agency added. The firms are encouraged to shop their designs around for other purposes outside of NASA, as the agency is hoping that other customers will buy spaceflights from the companies.